Clients & Profits keeps a detailed table of the stations you use for media broadcast buying. Your stations are listed here, and sorted alphabetically. Clicking once on a station displays its programs/times and standard rates. Double-clicking on a station ID opens the Stations window, where you can make changes to its details. Each station belongs to a vendor in the Vendor table. One vendor can have dozens of stations, each with its own set of programs, times, and rates. 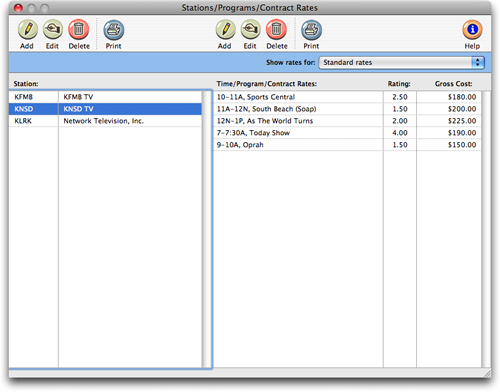 Stations are used by broadcast media plans in Clients & Profits X Pro and Job Tracker. 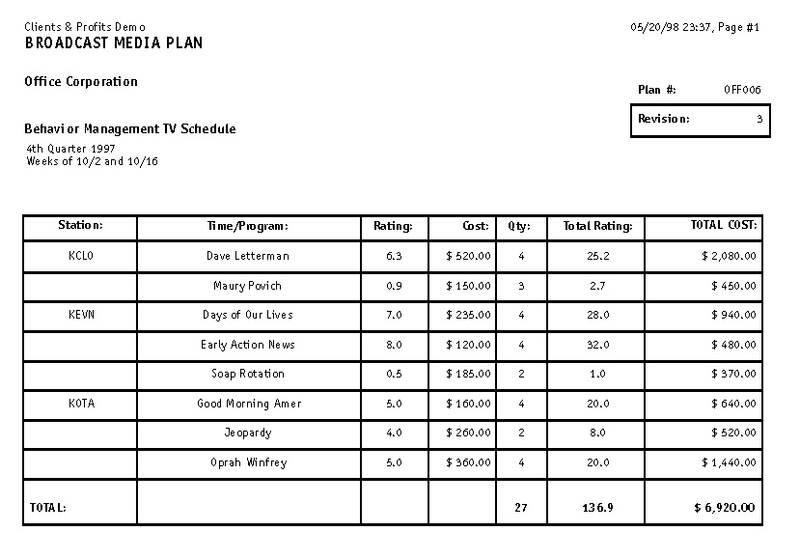 A broadcast media plan is composed of different spot buys for a broadcast month. Each program/time is added as a separate spot buy on a broadcast media plan, along with the number of spots that will run each day of the flight. When youre adding a spot buy, youll select a station from the Stations lookup list, which links the media buy with the stations programs, times, and rates. The Stations window shows both your stations (television, radio, and cable) and any programs/times you've entered for them. Youll enter, revise, and remove both stations and programs/times here -- the windows toolbar buttons let you add, edit, delete, and print this information as needed. And there's no limit to the number of stations (and programs/times) you can have in your Stations table. Learn about adding media publications and stations in this Clients & Profits classroom video training session. The Stations/Programs/Contract Rates window opens, listing your existing stations. 2 Click on the add Station toolbar button. 3 Enter the new stations vendor number, station code, address, and other details. The Stations/Programs/Contract Rates window opens, listing your existing stations. Double-clicking on a station opens the station window, displaying its information. 2 Make your changes, then click Save. The Time/Program/Contract Rates window lets you add, edit, delete, and print station, program, and rate information. The times/programs and standard rates for selected stations are listed here. Double-clicking a time/program record opens the Times/Programs/Contract Rates window, where you can change the spots details. You can set up standard rates for each program or time slot, as well as special program/rate combinations for each client. When a broadcast media plan is created, the right rate will be copied to the spot buy automatically. Choosing a client from the pop-up menu displays that clients special contract rates. A client is entered in the rates menu after a media plan has been added for them. The program/times/rate table needs to be updated as the rates and programs change. Use the Time/Program/Contract Rates toolbar buttons to add, edit, and delete programs, times, and rates for a selected station. You can also print a list of programs/times by clicking the Print button. 1 From the menu bar, choose Media > Stations. 2 Choose Standard Rates from the Show rates for: pop-up menu. 3 Click once on a station to select it. 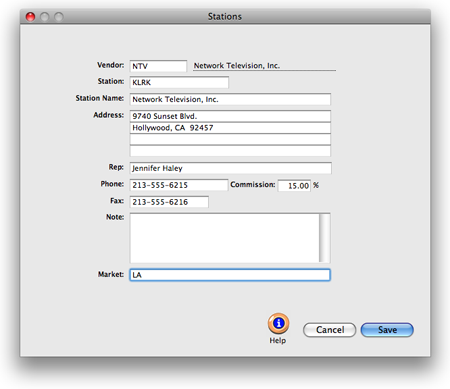 4 Click on the add program toolbar button to add a standard rate for the station's program/spot. 5 Enter the new program's time/program name, rating (Arbitron, Nielsen, etc. ), cost per spot, and other details. Clicking once on a station displays its programs/times and standard rates. Double-clicking on program/time for the station opens the Stations/Programs/Contract Rates window, where you can make changes to its details. 3 Make your changes, then click Save. 4 Click on the add Program toolbar button to add a contract rate for a program/spot for that client. 5 Enter the new program's time/program name, rating (Arbitron, Nielsen, etc. ), cost per spot, and other details for that client. Clicking once on a station displays its programs/times and client contract rates. Double-clicking on program/time for the station opens the Stations/Programs/Contract Rates window, where you can make changes to its details for that client.